The ruby cranberries, with its American roots, has long been known as a cure for scurvy before the discovery of ascorbic acid. Traditionally the American sailors took with them on their long journeys barrels full of cranberries, but suspecting anything without vitamins. The knowledge to the high vitamin content of berries was not discovered until much later and does so at the present time a very high medicinal value. The acidic berries are due to their antioxidant property commonly referred to as a silver bullet in the fight against heart disease, urethral infections or gum disease. Our dried CRANBERRY DELUXE, therefore, are not only delicious little contemporaries who may be tried in many ways but, by the way, you are doing even something for your health - with pleasure! 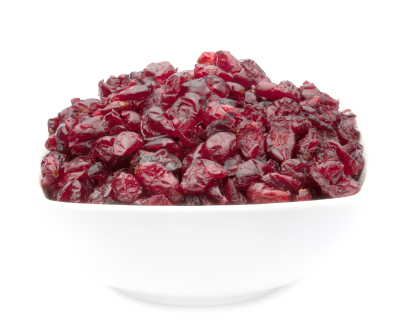 By using the delicious cranberries, you put not only technically flavour accents, but also visually ones. With its beautiful deep ruby colour, the cranberry DELUXE are a welcome relief in wild rice or Couscous. Of course, you can also mix our cranberries with your favourite cereal or enjoy along with cottage cheese and nuts as a tasty snack. Or how about a vinaigrette with cranberries as a splash of colour and exotic ingredient? The use of the delicious, dried fruit is nearly endless. If you like something special, you are served well with our CRANBERRY DELUXE. They will enchant you with their taste and appearance. Your astral body will thank you with a legendary aura and a fabulous smile. Let them taste good to you and your soul! Bon Appetit!